Some games are famous for their many moving parts. Mousetrap and The Grape Escape both come to mind, since players move around — or through — a machine in order to complete the game. But what if every character in a game was a cog in a vast machine? Imagine heroes and villains making their moves as the plot whirls around them, constantly altered by their choices, until someone emerges as the victor. Girl Genius: The Works places two or more players inside the guts of that machine, and leaves them to figure out how to make the machine work for them. It’s a card game that mixes simple moves — flipping, spinning, removing, and replacing cards — with deep strategic gameplay, since any card could start a chain reaction that hands you or your opponent points. The basic idea centers around a board made up of 12 facedown cards. Each player takes turns trying to score points by “popping” cards and adding them to their score pile. 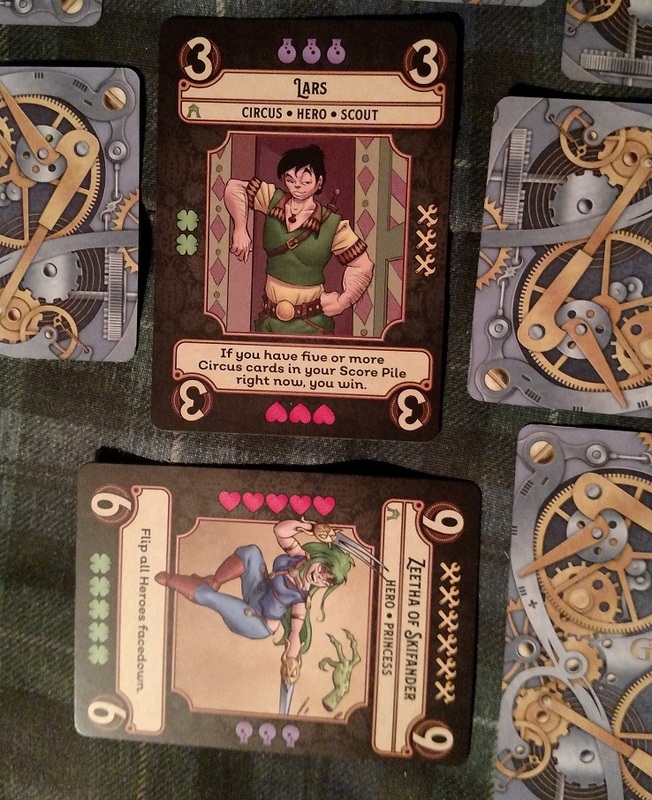 To do so, the player flips over a card on the board, revealing the character, the pattern of symbols along each edge, the card’s score value, and what happens when the card is popped. The player must then spin a faceup card 180 degrees, with the goal of matching the symbols along one side of the card with the symbols on a neighboring card in the machine. If the symbols match up, that spun card is popped, meaning you pick it up, and follow the instructions on the card. These instructions can range from drawing cards or popping additional cards to stealing cards from other players, rearranging the game board, or even new rules that allow you to win the game immediately. Once you’ve added that card to your score pile, you replace it with a card from your hand, rebuilding the machine. (Each player gets five cards in their hand to start.) Play then passes to the next player. 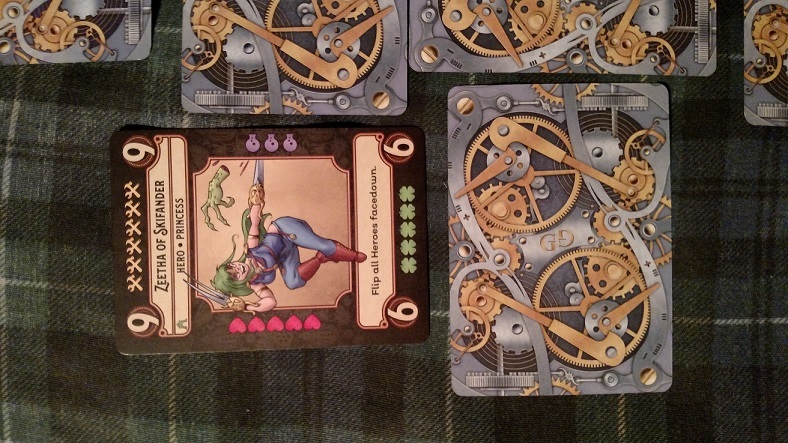 The wow factor of Girl Genius: The Works comes in those moments when you pop cards. The right combination of symbols can have you popping multiple cards at once, and once you start reading the instructions on those popped cards, the game can swing wildly into one player’s favor or another. 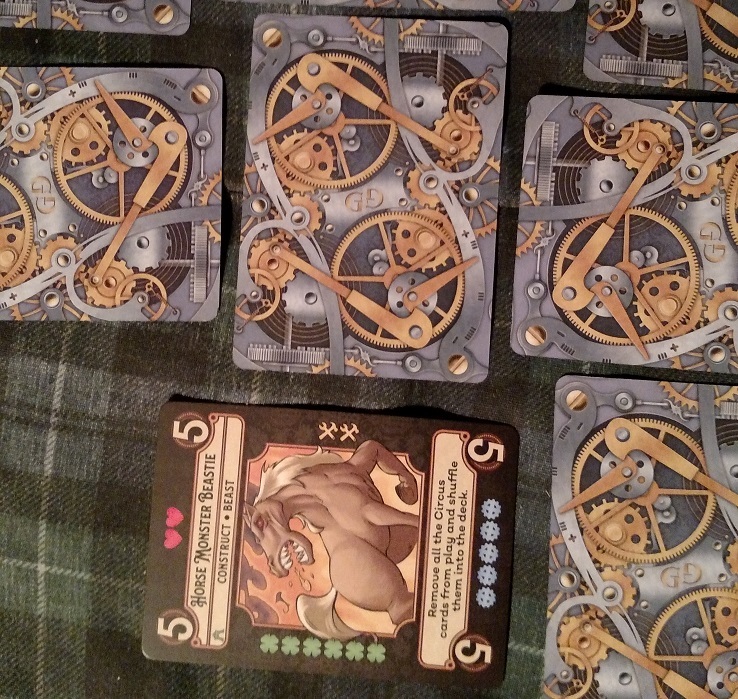 The characters on each cards, based on the long-running Girl Genius webcomic, are vivid and entertaining, and the attention to detail on the art extends to the back of the cards, where the interlocking gears depicted give you the image of a complicated, multilayered machine you’re manipulating to your own ends. 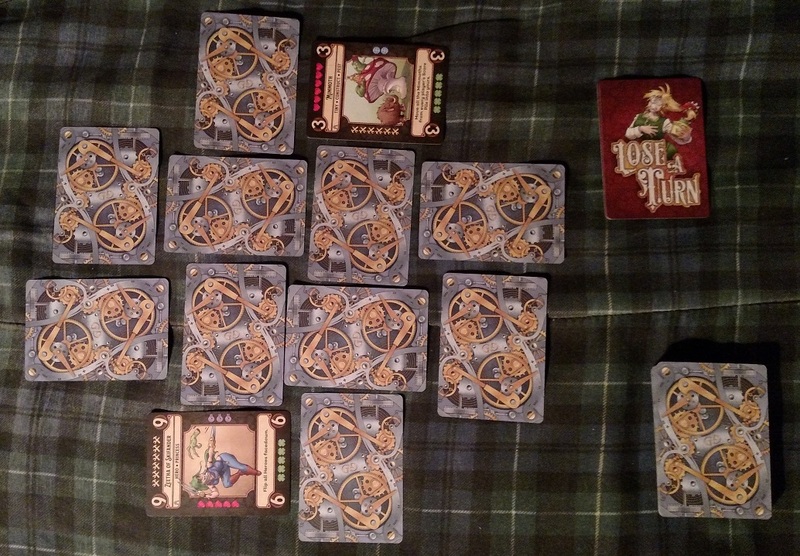 Plus, the board is different every time you play, adding a lot of replayability to a single deck. 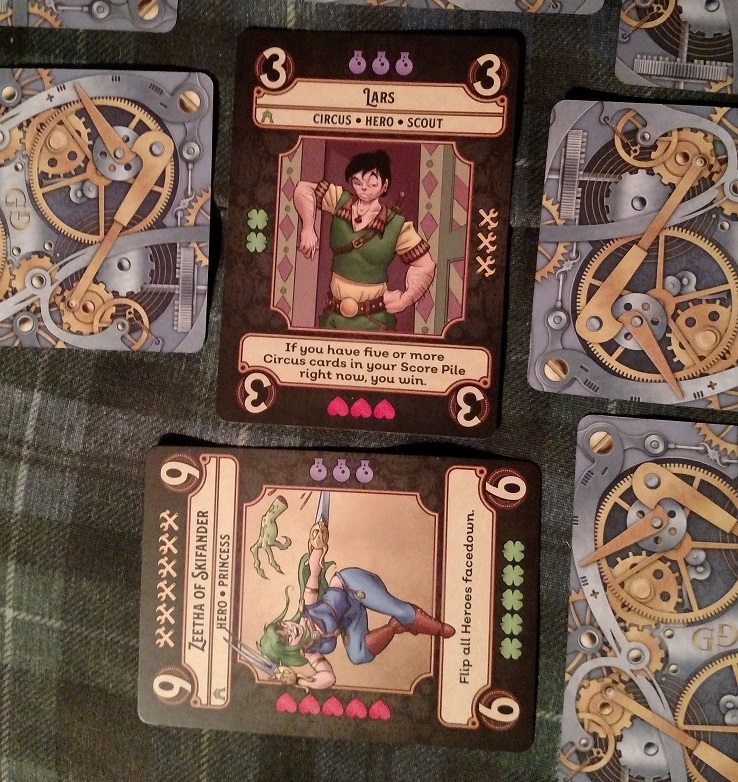 And remember, there are four decks to mix and match as you see fit, based on different storylines in the Girl Genius universe: Castle Wulfenbach, Master Payne’s Circus of Adventure, Castle Heterodyne, and The Siege of Mechanicsburg. That means you can play with practically endless combinations and permutations. Heroes and villains will collide in ways you never expected, based on simple actions like spinning cards. The strategy element is almost stealthy, because players get into the game too quickly to be intimidated by the sheer number of possible choices the cards allow. There’s no chance for new players, or younger players, to be overwhelmed, because they’ll be too busy enjoying flipping, spinning, and popping cards, and watching the machine spring into action. 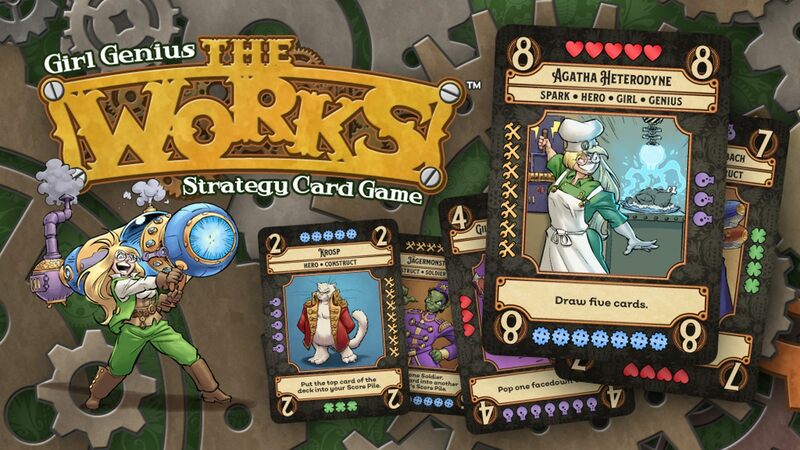 Girl Genius: The Works is terrific fun, a marvelous gateway into strategy card games, deck-building games, and more complex board games in general. Girl Genius: The Works is available from Cheapass Games. Be sure to check out all four decks to get the full Girl Genius card game experience, and visit our Holiday Puzzly Gift Guide for more puzzly gift ideas, including other Cheapass Games products like Button Men and The Island of Doctor Lucky!